Happy 2010 and a warm welcome to a new year of IT innovation and excellence! As the SysAid product has grown and developed, so has the SysAid team. Over the past few years, our numbers have steadily increased and our office space finally reached full capacity. While we do enjoy each other's company, things were getting a bit too cozy, so we upgraded - offices, that is! Although our location has changed, our vision remains the same. With this expansion, we can deliver an even better product and provide you with the reliable and committed support you've come to expect from SysAid. These changes coincide with a new year and new goals, and we have many exciting things lined up for 2010. We're currently planning one momentous event for this spring that will mark a new chapter in SysAid history! While I won't spoil the surprise yet, I promise that more details will be revealed in a week - you won't be disappointed! We also begin 2010 with exciting new IT Benchmark results. Since the release of SysAid 6.5, almost 1,000 SysAiders have implemented this new module to better evaluate the performance of their IT departments. We have now gathered enough statistics to calculate the worldwide averages for many of the measurements, so at last you can compare your figures to the Worldwide Distribution Charts! To see a full list of the results, check out the IT Benchmark module for yourself! Even amidst the boxes and bubble wrap of our move, the work never stops in the SysAid R&D department. With SysAid 6.5 just recently released, we've already developed a new minor release, SysAid 6.5.08. In addition to 30 bug fixes, SysAid 6.5.08 offers enhanced support for all you Mac users out there. Check out the release notes on our new support page to see exactly what's included in this minor release. Last but not least, we decided that you should start 2010 with a bit of fun. 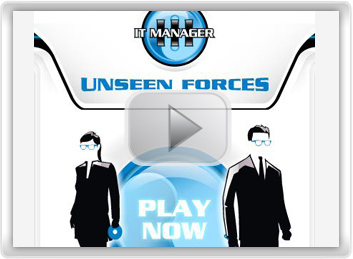 Check out this month's riddle as well as Intel's IT Manager III: Unseen Forces - nobody said working in IT was easy, but somebody has to do it! Welcome to a new year of IT success with SysAid - it's going to be a good one! Poll of the Month: What's the longest amount of time you've taken off for vacation? Riddle: Give it a Shot! New Year, New Results: Worldwide Averages Now Available! For the beginning of the New Year, we are releasing exciting new IT Benchmark results! In addition to helping you evaluate your current performance based on how you've done in the past, the IT Benchmark also allows you to compare your statistics with other SysAid organizations worldwide. 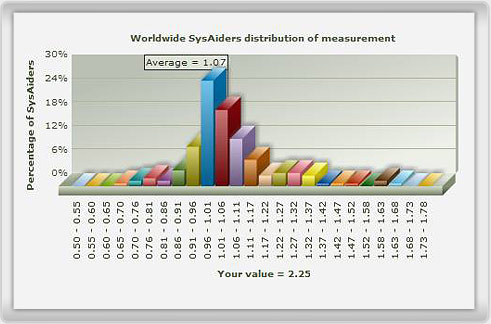 Since the release of SysAid 6.5 only two months ago, more than 1,000 SysAiders have contributed to the IT Benchmark and we've been busy compiling data to populate the Worldwide Distribution Chart to help you visualize where you stand. Until now, the chart has displayed a "Coming Soon" message. The "coming soon" day has finally arrived - 7 results are now available! To see a full list of the available results, now's the time to get started with the IT Benchmark if you haven't done so already. Go to your local installation, and under Manager, open the IT Benchmark module. Make sure that the measurements are enabled. Once you click save, the IT Benchmark will calculate the statistics and provide you with updated information. This measurement reflects your IT department's ability to close incidents and points to your overall ability to provide service to your organization. We now know that among SysAiders, the average opened/closed ratio of service requests is 1.07. The question is: what does this value mean and how does yours compare? A value of 1 means that all incidents that were opened during the period were also closed within the same period. We can see from the Worldwide Distribution Chart that nearly 50% of the SysAiders surveyed have a value of 1 plus or minus 5%. This means that they are resolving all incidents that arrive at their helpdesk every month. In the long run, you should strive to reach a value of 1. When you reach this goal, you can move onto the next step and evaluate how you're using your resources to make sure that they are being optimized. If over time, your value is steadily higher than 1, I recommend that you make a concerted effort to close all open incidents with the ultimate goal of reaching 1. During the time that you're busy closing open incidents, you may see that your value dips below 1. If your value is above 1 and is increasing over time, the gap between the number of opened and closed service requests in your IT department is widening. This means you are failing to provide full service to your business. You should take immediate action to improve your performance: review and improve your existing processes or perhaps hire more administrators. If the value is above 1 but is decreasing over time, you're still not providing full service to your organization but you're moving in the right direction. You're probably executing the right processes to improve your performance, and with these processes, you can strive to reach the value of 1. A value below 1 indicates that the number of service requests that were closed is higher than the number of service requests that were opened during a specific period of time. This means that your IT department accomplished more than what your business required at the time. It's likely that you're closing historical incidents that are still open. I advise that you analyze the rate at which you're closing these incidents and decide on how long you'd like to maintain that pace. After you've closed this gap, you should strive to reach a value of 1. If you're interested in seeing exactly how this measurement was calculated, check out the metrics description. Please remember that this measurement - and all other measurements, for that matter - should not be interpreted as stand-alone indicators of your IT performance and the quality of service you're providing. The measurements are interrelated and because the dynamics of your IT department are always changing, they need to be considered as part of a greater whole. The results of 7 other measurements are now available and more will be released soon. In the future, we'll provide international averages based on your specific industry. Check out the IT Benchmark Module for the full list of the results and see how your performance measures up against other IT departments worldwide! To help you get the most of the IT Benchmark, we've created a new IT Benchmark Community forum with detailed information on the different measurements. This forum gives you the opportunity to share your thoughts about specific measurements (in general or per your organization) as well as request the measurements you'd like to see in the future of the IT Benchmark. Detailed analysis into your IT performance is now at your fingertips - go check it out for yourself! Listen up, all you Mac users! We're happy to announce that SysAid 6.5.08, a new minor release, is now available. The major release of SysAid 6.5 went so smoothly that there were very few major issues that we needed to resolve. In addition to 30 bug fixes, this release provides better support for Apple users: the SysAid Mac agent now supports the attachment of screenshots to service requests as well as Mac OS Snow Leopard 10.6 and Mac OS Leopard 10.5. Furthermore, there is a different Mac agent to support earlier versions of Mac OS. To read the release notes and upgrade to this minor release, visit our new support page! If you ever need to be reminded of why you chose to pursue a career in IT, talk to Mike Parker. Mike has successfully implemented and organized an efficient IT infrastructure at Brian Johnston & Co. Ltd with SysAid, and his attitude towards the greater world of IT is truly inspirational. For Mike, IT means more than providing technical support and resolving service requests; it's an entire world of knowledge that gives him the opportunity to learn something new every day. "I think it is really exciting to be able to work in an industry that is constantly improving and growing," says Mike. "There are very few areas where new ideas and technologies are being created every day. As someone who works in IT, you need to learn and grow with it, and it's the challenge to keep improving that keeps me motivated." Brian Johnston & Co. Ltd., U.K.
"The relationship you can have with SysAid is what sets it apart from other products on the market." Since Mike's implementation of SysAid at BJINS 18 months ago, his accomplishments have been truly impressive. He has successfully implemented and organized an efficient IT infrastructure with SysAid; as an active SysAid Pathfinder, he has made valuable contributions throughout the Beta testing of our new releases; he is an active member of the SysAid Community, always happy to help out fellow SysAiders with issues large and small. He's even developing his own company to provide support and design services and is using SysAid to drive it forward! If there's an example of somebody who embodies the spirit of SysAid, Mike is it! See what Mike has to say about innovation, IT, and how he shortened SR resolution time from one week to one day! One of SysAid's most impressive tools for better IT management is the Manager Dashboard. It allows you to gain instant access to dozens of charts for a graphical overview of your IT department's activities and performance. Since the release of SysAid 6.5, even more charts have been made available to help you analyze your service desk performance and asset inventory. This tutorial shows you how you can create additional Dashboard views and select the specific charts you want to display. With these customized Dashboard views, quickly accessing the information you need is easier than ever! 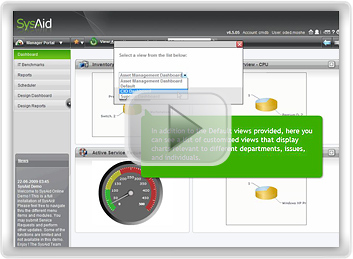 The Manager Dashboard module is an add-on module and requires an additional license. If you can't see it in your local installation, it might be restricted by permission controls. Watch the other videos in our tutorial series to see what else SysAid can do for you! Most IT departments (ours included) have a lot on their plates: providing technical support and ensuring high service quality is a job that requires 24/7 attention. Most teams have little spare time to invest in research, and hiring consultants to analyze your performance is often quite expensive. That's why the IT Benchmark is such a wonderful tool: with very little time and effort, you get detailed insight into how your IT department is performing. To get the most out of the IT Benchmark, it's important to make sure that you first filter your data with the Filter Builder. This tool ensures that your statistics accurately reflect your actual IT activities. Let's take the "Average SR's closed per administrator" measurement as an example. For this calculation, you only want to include administrators whose main activities focus on resolving service requests. If an admin who only closes a few service requests a month is included in the calculation, the average will drop dramatically and the measurement won't accurately reflect your true performance. To ensure that your statistics are meaningful, you need to define and exclude relevant values in the Filter Builder. Click on the Filter Builder icon next to any measurement. A regular Filter Builder window will open. Choose values under "Statement," "Assigned to," "is not," and the person or group you would like to exclude when this measurement is calculated. 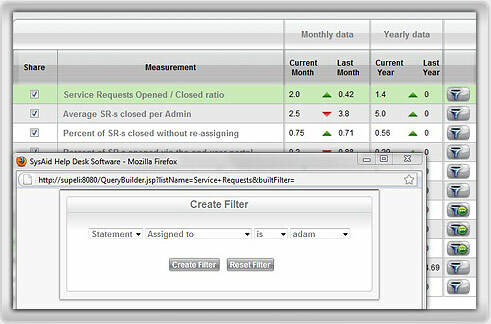 Taking just a few moments with the Filter Builder will ensure that your IT Benchmark results correctly reflect your actual performance. With practically no time and effort, you'll then benefit from instant analysis into your IT department's activities. For all of you hardworking IT professionals, we hope that the winter holidays provided you with the opportunity to get some much deserved rest and relaxation. In the demanding world of IT, the need to quickly resolve service requests and technical challenges never stops - even when you're on holiday. It's probable that for many of you, it's not easy to pry yourself away from work to enjoy some valuable vacation time. What's the longest amount of time you've ever taken off for vacation? Click here to take our poll! Which SysAid logo would you like to see in celebration of the New Year? It seems that for many SysAiders in warm and cold climates alike, the first snow of the winter beats the rest. From the four logo contenders, "The First Snow of the Winter" won by a landslide! We hope you had a chance to see it on the SysAid website. If you missed it, stay tuned for the next major holiday - there are more special SysAid logos to come! 7 men got on an empty bus, paid the driver, and sat down. Each man carried 7 bags, and in each bag there were 7 dogs. Each dog had 7 puppies. No one was missing a leg. How many legs were there on the bus? If you think you got the right answer, type http://www.sysaid.com/answer. For example, if your answer is 72, type http://www.sysaid.com/72 to see if you're correct. It's trickier than it seems! Have any riddles of your own? Share them here and show us how smart you really are! This month, SysAid's Joke of the Month is actually a game! You are the IT manager of a small company with big ambitions. Your task: master and deploy the technologies your company needs. It's not going to be easy, but somebody has to do it! Please note: you need to provide an email address to play.